Since the dawn of movies, filmmakers have been using the medium to tackle hot-button issues. In many movies, these topics are represented in a symbolic way -- just look at how many films in the 1950s used monsters and aliens to represent the communist threat. There are others in the industry, be it in fiction films or in documentaries, who like to tackle the topic head-on and have no interest in hiding it. A more recent trend is to make a film based on a true story from the past, where the subject matter will have bearing on a topic from today. Movies like Pride, Selma, and Carol are all set decades ago, but it's clear that the filmmakers are asking us to draw parallels between those stories and thing occurring in the present. The Danish Girl is the latest film to join this lineup. As The Danish Girl opens, it's 1926 and Einar (Eddie Redmayne) and Gerda Wegener (Alicia Vikander) are enjoying their lives as artists in Copenhagen. Einar is known for his landscapes, while Gerda is trying to get her portraits noticed. When her female model is unavailable, Gerda asks Einar to don a dress and stockings for her so that she can work. This seemingly innocuous gesture unlocks a long hidden desire in Einar, who begins to dress in women's clothing. Gerda is very supportive of this, and even encourages Einar to go out dressed as a woman and flirt with men. This alter-ego is christened "Lili" and Gerda's portraits on Einar in drag begin to take off. But, while Gerda is enjoying a new success, Einar is realizing that what he's feeling is more than just a desire to cross-dress. The female side is taking the forefront and Lili wants to do more than simply feel like a woman. 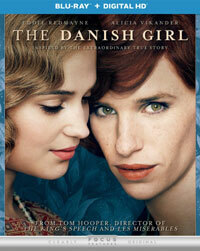 Based on a novel by David Ebershoff, The Danish Girl brings us a somewhat fictionalized account of the real-life Einar/Lili, the first person to receive gender-reassignment surgery. Obviously, this is going to draw parallels with people like Caitlyn Jenner who have drawn trans-gender roles into the American spotlight. Thus, this is one of those films which would make a critic think twice about critiquing it, lest they be labeled as ignorant or homophobic or something even worse. Well, let the insults fly, as I'm here to tell you that The Danish Girl isn't a very good movie, and it has nothing to do with the subject matter. I applaud the subject matter. It's important to let those with their head in the sand know that Caitlyn Jenner is not some kind of novelty. Those who feel that they were born in the wrong body is not a new thing and these individuals have always faced a very personal struggle. The only other positive thing that I can say about the film is that it's wonderfully shot. Cinematographer Danny Cohen has done an amazing job shooting Copenhagen and the European countryside, as many shots in this film would be stand-outs in a travelogue. No, the problems here lie in many other places. First of all, there are giant holes in the story. This is one of those movies which runs for two hours, and yet we feel that they could have taken just a few seconds here and there to clarify things. My biggest question from the first half of the film has to do with everything which Gerda does. We see her support Einar in dressing like a woman and going out as Lili, but we are never told why. Is it simply because she's a loving wife? Her motivations are never spelled out and the movie suffers for it. (In addition, someone could have asked why that one moment as a model allowed Einar to address his feelings.) Then, we have the transition from Einar to Lili. Gender dysphoria is a real thing and it relates to a person who feels different from their overt gender. However, this film portrays the character as if they have dissociative identity disorder. Lili seems to appear and disappear at random, as if the transformation can't be controlled. It's fine that they wanted to portray Einar has having a strong desire to be Lili, but as portrayed here, the behavior would have validated those who wanted to label Einar as insane. And then, we have the acting. I thought that Redmayne was good in The Theory of Everything, as he really inhabited Stephen Hawking, but it's clear that his talents don't always translate. His performance as Einar/Lili gets very annoying very quickly as he whispers nearly every line and he always has this very goofy, surprised look on his face, as if it's Christmas morning every few seconds. What should have been a very strong performance becomes cartoonish very quickly and it's difficult to take any of it seriously. Which brings me to my final point. Here we have the story of the first individual to undergo gender reassignment surgery. This brave person weathered scrutiny from their contemporaries and medical professionals, all the while jeopardizing their marriage, in order to be fully true to themselves. So, why is this such an emotionally cold movie. Director Tom Hopper made us pity a monarch in The King's Speech, but he can't muster a single tear in this confused, misguided film. The Danish Girl proves once again that an important film doesn't guarantee a quality film. The Danish Girl reminded me to tell my daughter's that they shouldn't mimic a stripper in order to learn to be a lady on Blu-ray Disc courtesy of Universal Studios Home Entertainment. The film has been letterboxed at 1.85:1 and the Disc contains an AVC 1080p HD transfer runs at an average of 31 Mbps. The image is very sharp and clear, showing no overt grain and no defects from the source materials. The colors look fantastic here, from the bold tones to the pastels, and the image is never overly dark or bright. The level of detail is impressive, as the image is never soft and the depth in the exterior scenes looks fine. The Disc carries a DTS-HD Master Audio 5.1 track which runs at 48 kHz and an average of 3.2 Mbps. The crowd scenes and those scenes taking place on the street provide us with some stereo and surround effects which show good separation and some detailed individual sounds. Otherwise, this quiet drama delivers audible dialogue, but not many demo-quality sounds. The Danish Girl Blu-ray Disc contains only one extra feature. "The Making of The Danish Girl" (11 minutes) offers comments from Hooper and the principal cast, who discuss the story and the themes. They also touch on the cast, characters, and the working relationship with Hooper. The location shooting in Copenhagen is examined, as is the makeup and hair, which is crucial to the Lili character.